On 28th November this reflection and dialogue session was held in Granada. During the session the challenges to be addressed to personalise integrated care were assessed. The aim of the 6th OPIMEC Forum 2017 was to provide professionals with a forum for reflection, to share experiences and analyse basic tools to promote health care focused on the person and not on the illness. 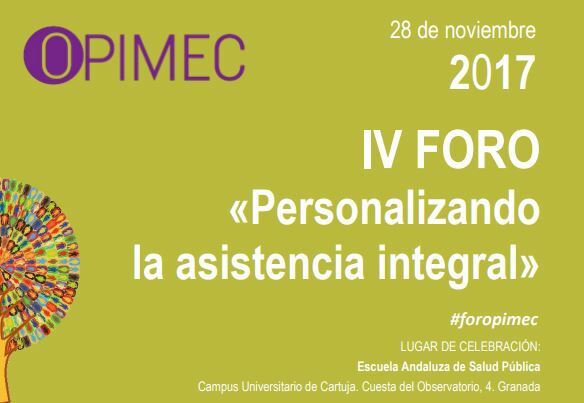 The forum was organised by the Observatory of Innovative Practices on Complex Chronic Disease Management, known as OPIMEC (Spanish acronym) and the Andalusia Plan for Integrated Care to Patients with Chronic Diseases or PAAIPEC (Spanish acronym). This event was oriented to managers and directors of healthcare systems as well as professionals of the Andalusian Council of Health and Health Service involved in chronicity-related projects. In recent years, healthcare systems have made very significant contributions on scopes which should be assessed within the context of each patient and on how to include the person in the decision-making process. Many healthcare systems have already started to make progress towards a progressive involvement of patients and shared leadership between patients and professionals. The goal is to develop Personalised Healthcare Plans, where the patients’ values and preferences are the starting point. In this regard, Kronikgune had the opportunity to present the work currently in operation under the European project C3-Cloud. In this project, personalised healthcare plans aimed at complex chronic patients will be developed and deployed using different technology platforms. Esteban de Manuel Keenoy, Kronikgune Director, described the work being undertaken to promote integrated healthcare and involve the patient and/or carer in the management of illnesses. These personalised healthcare plans will include the agreements made between patients and professionals. Furthermore, these plans will allow reconciliation of different clinical and pathology guidelines and promote co-ordination and communication among different care levels. The Basque Country is one of the pioneering project partners where the pilot programme will be operating. This programme is expected to start at the end of 2018 with the participation of over 600 patients of the Basque healthcare system. For further information about the C3-Cloud project, click here.